The work of public historians so often involves restoration and conservation, revitalization and reparation as we attend to tears, breaks, and ruptures, deterioration and damage, both tangible and intangible. 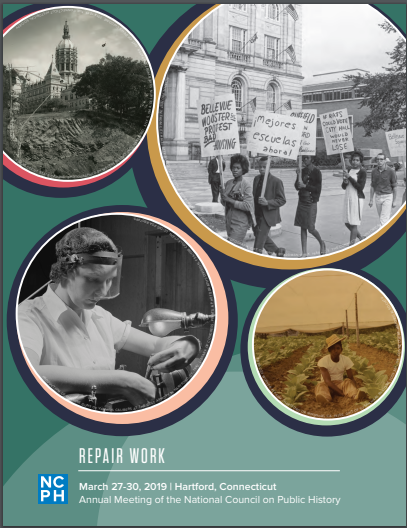 Our theme, “Repair Work,” invites us to consider the various ways in which public historians labor to mend, to rebuild and reclaim, and to heal. Ours is an appropriate theme as we confront challenges of deindustrialization, decline, and violence, while also pursuing paths toward recovery and rebirth. Hartford offers a productive setting for such contemplations. The Connecticut River itself is a story of repair and recovery. To help us think through our own relationships to repair work, our hardworking and thoughtful Program Committee has gathered together sessions teeming with opportunities to share strategies, concerns, failures, and successes. The conference also offers means by which to acquire and sharpen the tools of our practice. The meeting will include Preservation Leadership Training in partnership with the National Trust for Historic Preservation alongside workshops on podcasting, grant-writing, oral histories, history relevance, consulting, and immersive gameplay. Meanwhile, our stellar Local Arrangements Committee has arranged outings to advance conversations around development and redevelopment, the preservation of Indigenous, African American, and Anglo American pasts, and the role historic sites can play in addressing contentious contemporary issues. We particularly hope that this gathering can help us all confront epidemic gun violence and contemplate ways that public historians can help the nation address this crisis. From the plenary to sessions to tours—including a digital hackathon workshop on the documentation of mass gun violence and a tour to the emerging Coltsville National Historical Park—we will look hard together at this pressing issue. Our annual meeting is itself an occasion for repair and renewal; we gather to restore our vision, to reset our priorities, to refresh longstanding ties, and to create new ones. In the 18th century (the historical era I know best), the verb “repair” also meant to return, or to make one’s way. The conference registration fee covers admission to the sessions, working groups, breaks, exhibit hall, poster session, public plenary, conference mentoring network, and other events. The fee also entitles each registrant to a conference Program and badge. Some special events require pre-registration and/or payment of additional fees. All presenters and conference attendees are expected to register for the conference. Name badges and lanyards are sponsored by Central Connecticut State University. Registration is available online at www.ncph.org or by completing the form at the end of this Program. To register by mail, submit the form with a check payable to “NCPH” in US dollars. Visa, MasterCard, American Express, and Discover are accepted through online registration only.